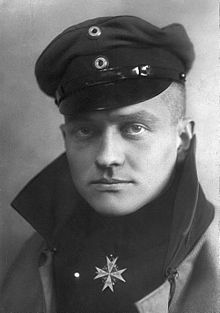 My novel in progress includes mention of the Baron Manfred von Richthofen, aka the Red Baron, the Kaiser’s fearless flying ace, who reached cult status on both sides during World War I for his prowess in shooting down Allied planes. An arresting figure as you see here. Consider the eyes. He defined himself as “a hunter,” satisfied only “a few minutes” after each successful hunt. He had silver cups made to commemorate each kill.